It's a common nightmare of any newspaper editor: The biggest story of your lifetime comes along, but you have no way to get the news out. 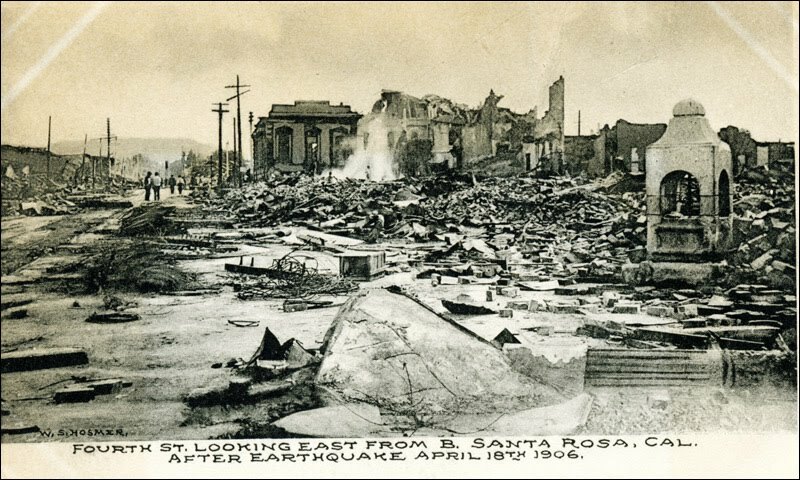 Such was the dilemma faced by the Santa Rosa Republican and Press Democrat after the April 18, 1906 earthquake. For most of the next fourteen days, the rival newspapers published a combined "Democrat-Republican" edition using a small printing press that was normally used to print Sweet's Business College's "Saul's Letter" and was, as Tom Gregory wrote in his 1911 county history, "about the dimensions of an infantile pocket-hankerchief." The hanky-edition of the paper(s) is disappointing to anyone seeking out ghastly tales of death and destruction, even though some out-of-town newspapers at the time were describing Santa Rosa as a modern-day Pompeii laid waste. Mostly the thin twelve editions served as a newsletter listing the whereabouts of displaced persons and temporary locations of stores, reports on disaster related civic matters including building permits and relief ("G. E. Smithers brought in a load of eggs...a tierce of hams, a barrel of salt pork and a huge case of clothing were received Saturday from Patterson, N. J..."), notices of aid available to members of the many fraternal organizations, and lots of news articles describing San Francisco as a modern-day Pompeii laid waste. Still, it's a remarkable document of Santa Rosa's history (PDF). With space at a premium on the tiny pages, even a visit from California Gov. Pardee, the U.S. Commerce Secretary, the general in charge of San Francisco and other officials merited only a single paragraph. After listing names and titles, the paper noted tersely that the group "walked up Fourth street through the blocks of ruined business houses, and then entered automobiles and were taken around the town and shown the various residences which were wrecked by the earthquake. The sights which met the gaze of the visitors was one that they will never forget." Still, there was room to squeeze in the latest from the melodramatic life of local beauty and wealthy widow Abbie Treadwell: "Mrs. Abbie Treadwell Hall and her husband, Dr. Walter Hall, the Petaluma dentist, whom she sued for divorce, have made up again and are living quietly in San Rafael. Mrs. Hall lost over $300,000 in the San Francisco fire." Mrs. Keithley of Bodega reports that two of her cows died of fright during the earthquake. Anxious relatives and friends of Santa Rosans are arriving here from all over the Pacific Coast to make inquiries. A quantity of provisions have been received by Dr. H. W. Mallory for the Independent Order [of] Foresters. Members call at Mallory residence, 450 Beaver. Hundreds of people gather at the depots upon the arrival of each train and eagerly scan the passengers for relatives and friends. Former Congressman Bell, representing the [Fraternal Order of] Eagles, arrived here today with financial relief for members of the order. The amount of mail matter that is being received here is immense. Tomorrow morning [Sunday, April 22] services will be held by the various churches, either in their edifices or in the lots adjoining. In the afternoon there will be a union service in the old College grounds [College Ave and E, now Santa Rosa Middle School] in which every church in town will participate. Several hundred visitors were attracted here on Sunday [April 29] to view the ruins and several hundred Santa Rosans did a similar thing in San Francisco. Hundreds of belated telegrams are being received here daily for Santa Rosans and Sonoma County people. There are several individuals in Santa Rosa at the present time who can find nothing better to do than to go about inspiring alarm in nervous people by stating that some fool has predicted another earthquake, naming several dates. One of the alarmists was threatened with a thrashing if he did not desist.